This is my third attempt at making trousers (first two attempts here and here). After getting some help with the pattern locally, I decided to make a pair from start to finish that I could wear. Would love some comments and criticism, I plan to fix issues with the fly and tighten up the waistband and add another dart in the back. Other than that are there any issues I am not seeing? Why do you feel you want to add another dart? 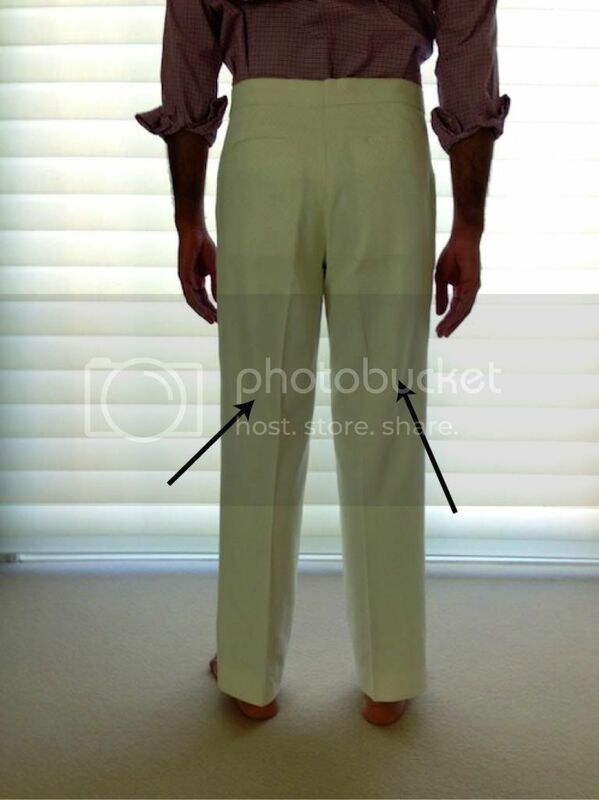 Just another thing, I have a theory about why trousers fit so badly, and I wondered if you still had the pattern from your other attempts and could post them. I'd like to see if my theory is confirmed in any way by your pattern history. Personally, I disagree with the general view on here of Rhinehart's draft. Out of the three muslins and two finished try-outs I've made from it, I've found it easier to tweak and the seat seam never fails to turn out correctly in terms of proper length and shape. The two muslins I made of Mansie's draft (one of which I still use as lounging trousers) is comfortable in terms of the general all-over ease, but the seat seam was too short. Of course it's probably my inexperience in fitting. Edited by Henry Hall, 10 December 2013 - 02:08 AM. By the way, thanks for all the help in the previous threads Terri! I was thinking maybe adding another dart (like all my other trousers) would help? 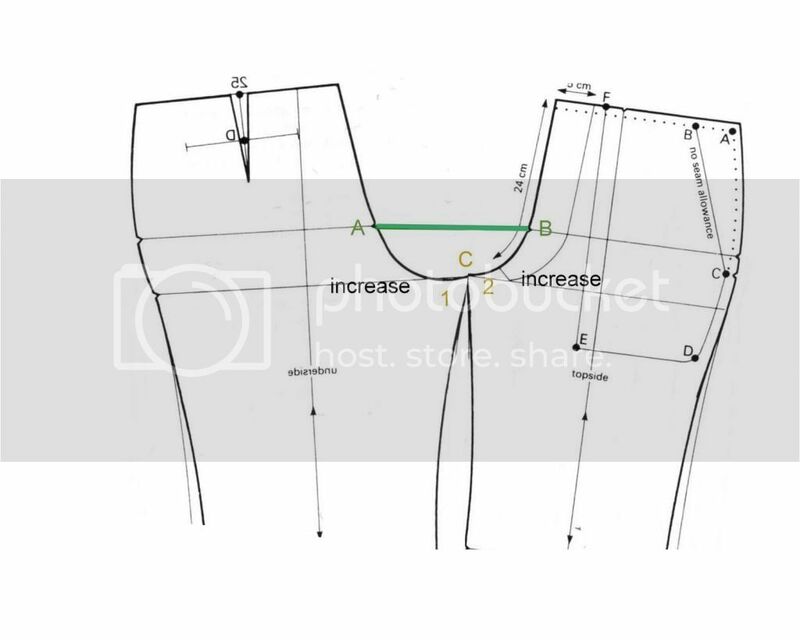 I was also thinking for my next pair of trousers I will also try taking more out from the side seams instead of the center back seam, maybe that will alleviate the issue without the need for the extra dart? After the second attempt I also went to a local pattern maker and asked for help correcting my pattern. The main issue she saw was that I didn't balance my pattern. She corrected my pattern so that the width of the red and blue portions (see picture below) would be equal in my pattern and line up nicely. My previous pattern was crooked from me taking things in and out and trying different things when I was making samples. I started with Mansie's draft. Did a bunch of pinning and trial and error to adjust the pattern to get the fit I wanted. Then got some help from a local pattern maker to fix all the problems. Edited by tld9v1, 10 December 2013 - 03:19 AM. Very curious to hear your theory, Terri. And when you say badly, are there any specific issues in mind, or just all around butchery of fabric? Edited by Che Pasticcio, 10 December 2013 - 07:41 AM. I wish I could see the patterns that are being used in ready to wear, because I think the basic shape of the pattern is wrong (especially the development of the back piece, and it seems to fit badly to some degree in most situations. Anyway, I cannot make a sweeping judgement from just this one situation, but I will post my thoughts when Inget a chance to think a bit more. I'm not quite sure where I read it, but isn't it the case that many RTW patterns are created from Rundschau drafts? Looks nice. Fit could maybe be further enhanced to avoid these folds. Maybe this could help. But rather ask other members what they think as fitting trousers is already so difficult in real life when one can touch and pin etc. FYI: scooping the back crutch curve will make the back fork longer (and, the draping under the buttocks worse). A tighter seat requires a shorter back fork. The drag lines you see are related to the cotton draping over the buttocks. Imagine this in wool. I'd shrink the hollow under the buttocks with ironwork and then shape the calves (slightly). Take note of the iron work you do on a wool sample and fit it again. The solution may be more ironwork or it could be pattern changes. At this stage, it's not evident to you, yet. This version is much better than the other two! That said, it can still have improvements. From the way the right side of the trousers fall I guess your right hip is slightly stronger? Having asymmetrical hips is quite normal. Just add the difference to the respective side of the pattern. 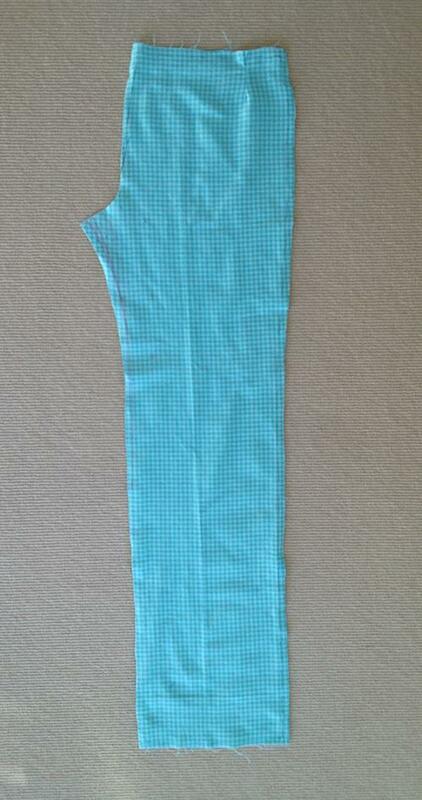 It usually is within the range of 1 cm or 1/2", so adding that amount at the waist seam is good enough. If it's more you have to cut and open the pattern. From the looks of it, the fronts appear a bit short. To check this pull the waist band down a bit to see if the folds at the front crotch disappear. This will also influence the way the rear trousers will hang, so don't make any changes to the back yet. Except for this: Control the lengths of both inside seams. The rear one should be shorter by at least 0,5 cm for hard to stretch materials, 1 cm for wool or wool blends. You need to stretch (iron work!) the rear inside seam to match the front inside leg seam. By doing so you will eliminate creases below the buttocks. Another hint: It's probably a little known fact that the knee width has a huge impact on how the trousers sit at the hips. I'm sure I made a post about this on the forum before, but I can't find it right now. 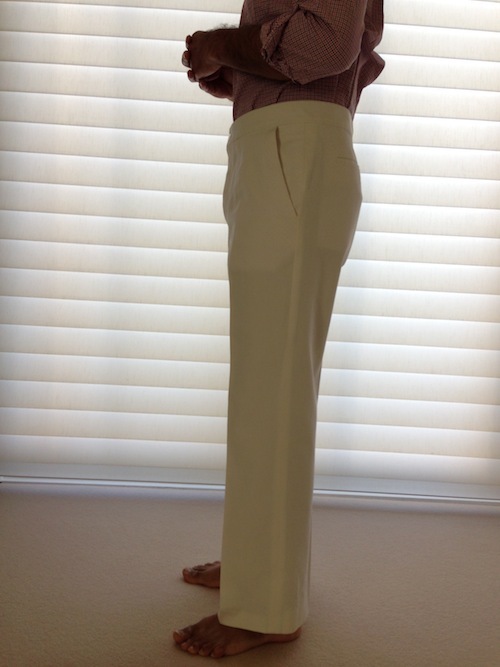 Fact is: Trousers with a small knee width will provide more room at the seat level than those with a large knee width. That's why jeans are usually more comfortable to wear, even though they have a smaller fork width than average suit pants. To Terri's point re: bad RTW patterns, and SG's point re: knee width affecting the fit and drape of the panel. 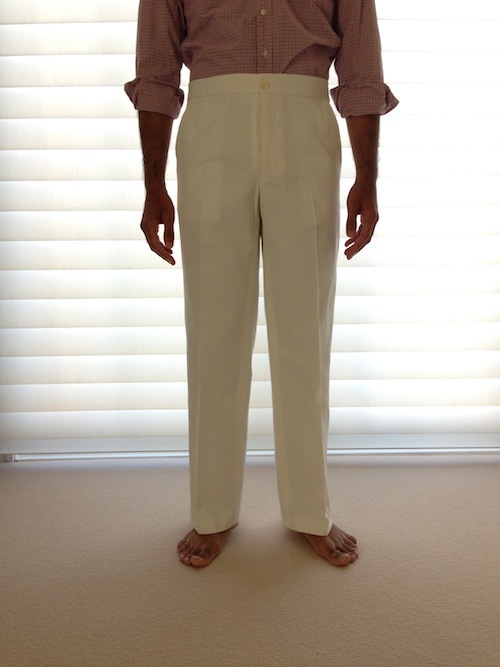 The patternmaker that helped this chap appears to be "old school". Few of the younger patternmakers in the RTW sector know how to balance a pattern. And, it appears she knew to make the front inseam 1/4" longer than the back inseam. What you may be seeing, Terri, are the results of bad ruboffs of bad patterns. I temped at a well-known west coast designer brand whose "patternmakers" used duct tape to plaster other manufacturers' garments onto a digitizing table without any regard to grain, stretch or balance. Some of the resulting patterns were ghastly. I suggested it would have been much faster to re-draft (and, grade) directly in the CAD system than to digitize. My contract ended early; and, I was quite relieved. 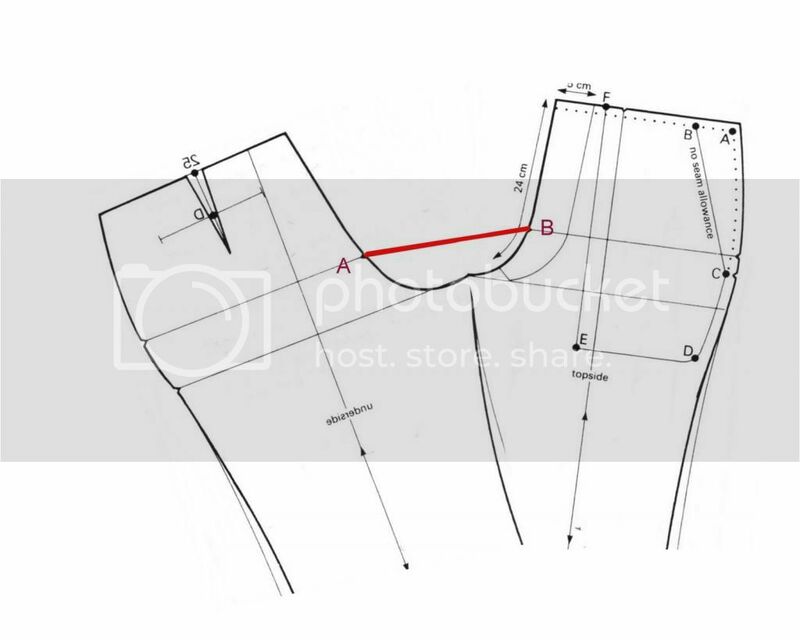 For custom clothing, learning to balance a draft before cutting a sample and making sure the fitting method retains the balance is fundamental. Each client's body deviates from the draft is some way. And, that's perfectly OK. A strong foundation provides a logical, rational and quantifiable (or, measurable) end result. For example: now that SG knows this pattern is balanced and in a hard woven, he is able to assess that one hip is stronger than the other. I'm sure I made a post about this on the forum before, but I can't find it right now. I would like very much to read that, Schneidergott. I'm sure it is not here. This is where I have gone wrong several times when transferring fitting alterations back to the pattern. All the small changes clearly knock the balance out, but where in the usable books does it discuss clearly the re-balancing of your altered pattern? Yes, the books don't have it all, but a learner can't work everything out from scratch for himself every time. It makes those self-tutoring dependent upon the the chance pieces of knowledge from those who know about this sort of problem already...and I'm grateful for it! It just makes things seem harder and slower than they could be. I am almost certainly sure that I have posted this before. Just a post, not a thread. ​What this basically means is that for the wider knee width you need a wider crotch diameter and vice versa. Excellent. Short and sweet, but explains a lot. One person posted a book (pdf?) about fitting rtw and in that book it says never to gouge out the seat, but make sort of a U shape. As JCProwls says, every garment needs to be balanced. This makes sense. However, after fittings (such as those suggested in this thread http://www.cutterand...p?showtopic=403 ) one ends with red and blue portions not equal anymore. Did I missed something ?